At some point after my departure from Smurfpunx I got briefly involved with this exhibition-tour of the Apostles bloke. I wanted to help out Anderz Nielsen [guitarist of ‘Misanthropic Charity’ and bass for ‘Electric Deads’ & ‘President Fetch’, and concert-promoter at Copenhagen’s Ungdomshuset] because I met these guys from the ‘Apostles’ when I visited him in 1987 and they ended up asking me later on to organize exhibitions and concerts in Belgium. It was an outstanding commitment and a friendly service to Anderz who had welcomed me a few times in his flat in Copenhagen. The artwork were mainly charcoal-drawings if I can remember well, and not bad work either: dark and gothic-anarcho, but well…the artist’s and the music genre’s house-style I guess. (smile) Such an expo would’ve been something else for a change. But for some reason or another (something to do with the availability of the space [Brob: Probably because there were only people at the Gele Limonade during weekend-evenings.] and/or abolishment of a concert at Netwerk that could have been combined with this), it got cancelled. The funny thing was that the artist, his girlfriend and one other bloke eventually showed up in Gent despite the cancellation. See, as I told already on this blog, the main ways of communication back then were telephone and ‘classical’ post. They had no phone and it turned out that they never got the letter announcing the cancellation either because the address that they’d given was a squat which they had abandoned. Anarchy I guess… (smile) Did they had an improvised expo in a squat in Gent instead? I don’t remember. I was not in the squatting-scene. They did continue to another country (Holland, Germany?) though. Usually whenever I see the words ‘The Apostles’ in it I groan, start to gnash my teeth and then sit in a dark corner to mutter vengeful curses at the world. However, this is a little more interesting. No, the event doesn’t apply to me – but I know what happened. During 1987 and 1988 the bassist / guitarist / leader of ‘The Apostles’, Dave Fanning, was invited over to Germany [Jospeh Raimond: The ‘Apostles’ show was in Nürnberg. It was great.] for 2 weeks to display his art in a private gallery there. This was organised by Joe Raimond of ‘Doc Wör Mirran’ [Brob: concept of combining music, graphic art, painting, sculpture, poetry and just about every other medium of art]. As I understand it, the show was such a success that he then took his paintings, drawings and collages, etc. to other ‘punk’ events, alternative galleries, etc. to display them there. I believe he went to Belgium because he had a Belgian girlfriend, Sally Vogel (?, not certain about the surname) at the time and she may have assisted. 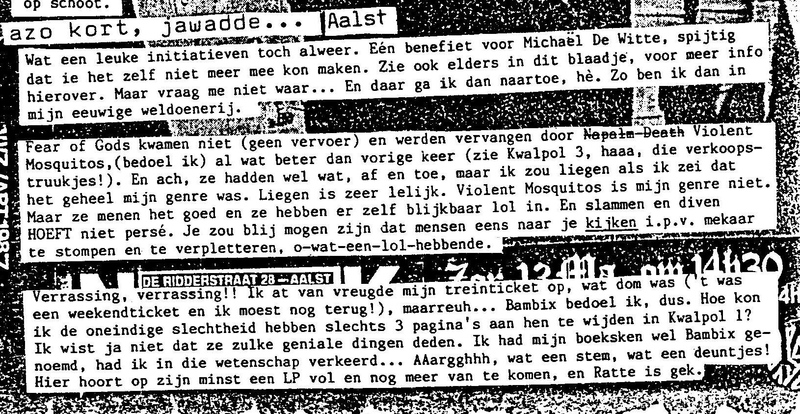 During the X-mas holidays 1988 some of us Smurfpunx (Mokka, Natasja H., Anmie, Frank, Brob & Fitzjoy – Natasja D. & Guy had to call it off last minute because his grandma died) drove to the Van Hall squat in Amsterdam in a rented mini-bus to stay there a couple of days and spend some time with Lorelei & Syd (who invited us). I had set up a small tour for my German friends in ‘F.F.F.’ and their mates ‘Upside’ (Italy) and they were also playing there one night. 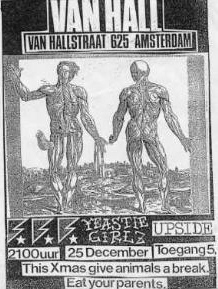 We were able to witness how everything was working there: a bit shocking was how little support L & S got from anyone to set up their shows (Van Hall at that time being the only independent independent concert-place but the A’dam scene seemed to be on the brink of apathy about this…). So we lended a hand while we were there: I remember driving our mini-bus through the little streets/ alleys and on the narrow bridges over the Amsterdam canals to go pick up the P.A. We also experienced how people lived there and got to know the Italo-Canadian couple a bit better. It was a damn big place (an old bike-factory) where you could get lost easily and where all the people living there (mostly Italians, a South-African girl,…) had more than enough space. One thing though: it was incredibly cold! But most of the nights we could spread our sleeping-bags around the stove (the only one in the whole buidling) in Lorelei & Syd’s bedroom, who were telling us bedtime- and other stories lying in their big canopy bed… We talked a lot and had quite some fun. I remember Syd showing pictures from a book with tattoos and piercings, and some of the younger girls discovering that a ‘Prince Albert’ was something more than just a member of the royal family… (smile) We also met more interesting people. Two of the three ‘Yeastie Girlz’ were living there (Joyce & Cammie, Jane had gone back to California already). They also performed the same night as the previously mentioned bands… Another person who we were to meet again later was Semolina, a talented dancer from Spain who was taking courses in A’dam and lived in Van Hall. She was friends with Boliche & the lads of ‘Subterranean Kids’ who we would meet later on. At the gig I met Frank ‘Kaboem’ (a very decent zine) whom I’d already talked in Zoetermeer’s ‘Mevrouw Latenstaan’ earlier. I was 16 years old and I really wanted to go to Van Hall with Mokka, Frank, etc. But what did I have to tell my parents? 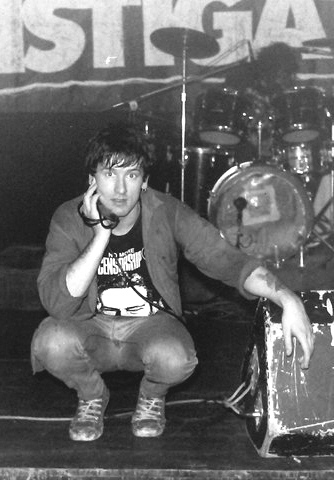 “Mum, dad, I’m going to stay at a squat in Amsterdam with a bunch of punx…”. I don’t think so! But I also didn’t want to lie. So I told them that I had a very difficult test (sociology) coming – which was true – and asked if I could stay over at a girlfriend’s house for the weekend if I could get a 8/10. You have to know: I was sitting next to Duco for sociology, and he was very good for that class, so he would always let me crib. Off course I got good grades! I let my parents sign for the test and they agreed to let me sleep over for the weekend. My dad drove me to my girlfriend’s house where I got picked up by the rest of the Smurfpunx to leave for Amsterdam a bit later. 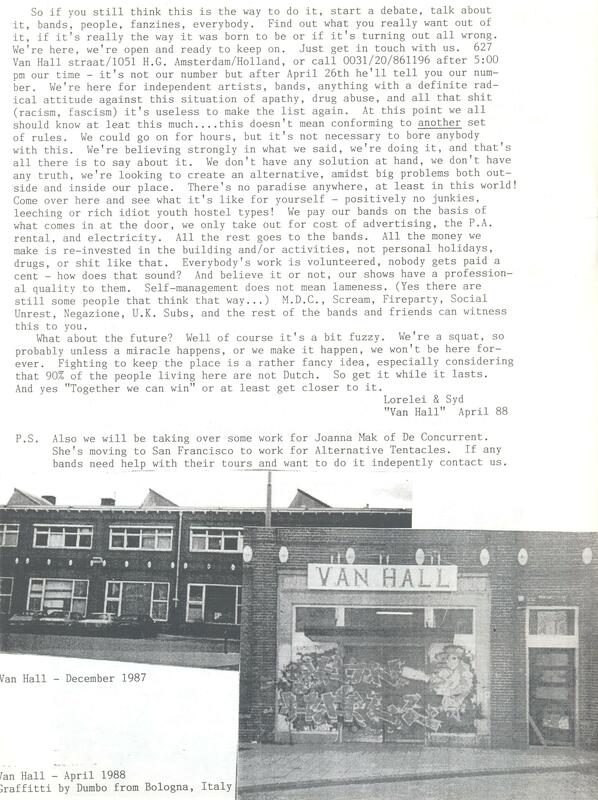 We were well recieved at Van Hall by Syd and Lorelei, and I looked around astonishedly. The big factory was filled with junk, there were quite some extravagant people walking around, and Syd and Lorelei’s room was also decorated in a rather special way, to say the least. It was full with X-mas lights and these stayed on even at night. Because I could only sleep in complete darkness, I asked Lorelei why the light couldn’t be turned off. She told me the lights definitely had to stay on because there were ghosts wandering around at Van Hall. There were many but their ‘house-spirit’ was an old woman that kept walking around chattering the whole time and to keep the ‘ghost’ out of their room, the light had to be kept on. I thought she was kidding me but in fact she was dead-serious; and Syd went along with the whole story. As a kid I had watched ‘The Exorcist’ all by myself and then I’d stayed downstairs the whole night because I didn’t dare to go to bed anymore. That had left such an impression that I’m (still am) afraid to watch movies that deal with ghosts or paranormal things. Lorelei also told me that if I had to go pee that night, I would see the ghost in the big space. Of course I didn’t get any sleep and at 3 p.m. I had to go to the toilet. Frank [Brob: Anmie’s boyfriend at the time.] came with me and even though it was creepy, luckily we didn’t see anything. But at 5 p.m. I had to go again, probably because of nerves, and since I was a tough girl, I went alone this time. And for sure: somewhere at the back I saw a twattling old woman walking in the moonlight. I don’t know if it was a lost vagrant or a drunk but I was scared to death. When I told Lorelei about it later, she said “Oh yeah, that is her allright!”. Looking back it was probably a joke but for some reason this is my sharpest memory of that weekend at Van Hall. Thanks to Syd’s tattoo-book I also learned what a ‘prince Albert’ is. Frankly, at that time I found the idea of a pierced willy to be shocking. After he described how having such a piercing was done in practice, I didn’t want any nose- or other piercings later. Now that I design jewelry as a hobby, I would’ve liked to have a few punctures here and there; but I’m afraid. I got a double trauma at Van Hall, haha. The performance by the ‘Yeastie Girlz’ was super. The women stood in front of the stage, a few tough blokes more at the back shouting comments. Hurt egos when hearing the lyrics? Haha, I sure thought it was funny. When my dad came to pick me up at my friend’s after the weekend, he asked if it had been fun in the Netherlands. Apparently he had seen that the guilders in my room before leaving. I’m still grateful that my father trusted me enough to let me go, even though he knew I had plans to go to A’dam in stead of to my friend’s in Aalst. I told him I went to concerts and stayed with friends. He didn’t need to know that it was in a squat. Luckily my dad didn’t say anything to my mom: I would have been grounded for a 100 years, guaranteed! “This concert is a benefit for the ‘Stichting Michaël De Witte’ and all profits will go directly to that ‘foundation’. The foundation was established in remembrance of the young Flemish doctor Michaël De Witte who died in El Salvador February 8th, 1987. It’s first goal is to publish a book about the life of Michaël based on this own writings and testimonials from friends. The second goal of the ‘Stichting’ is the continuation and expansion of Michaël’s life-work, by offering financial and material help to doctors and medical staff who, just as Michaël, want to commit themselves in the Third World, to build a fairer society for the common people. Michaël graduated as a doctor in 1982. Because he saw that there are more doctors than necessary in Belgium, he decided to move to a country with a desperate shortage of doctors. He chose El Salvador because the population there had entered the resistance against a regime of murders and exploiters. For years the people tried to defend their rights but the landlords, the army and the death-squads reacted with a reign of terror and murdered anyone who dared to raise their voice. 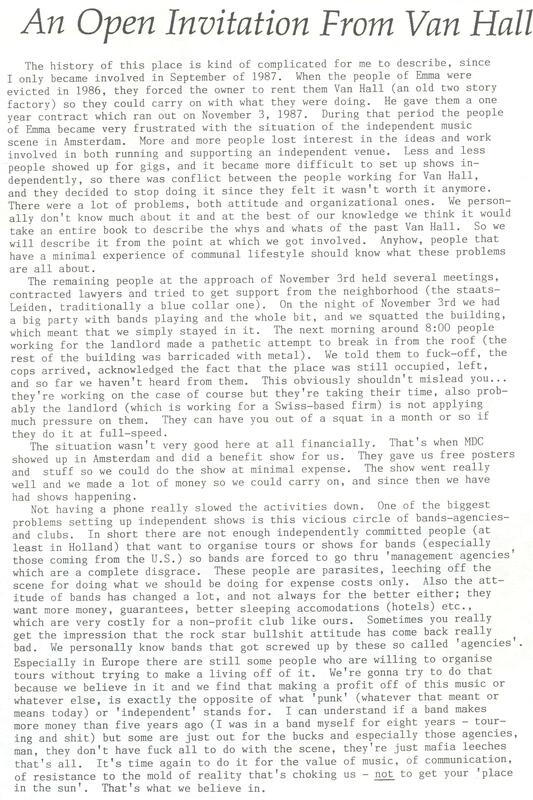 Therefore the people were forced to chose for armed resistance, as the only opportunity to end their poverty and exploitation (not unlike the A.N.C. in South-Africa). In the meantime, the resistance has been able to liberate a quarter of the territory, thanks to the massive support of the poor peasant-population. In these liberated areas, the resistance fully works on the just redistribution of the land and resources. It’s in those areas that Michaël worked as a doctor. He treated the local population for free, set up hospitals, trained doctors and nurses, learned people about better hygiene and a lot more. He also operated wounded resistance-fighters. Because of the continuous danger, it was a hard life but Michaël got a lot of work done, saved dozens of lives. He was very popular with the poor peasant-population. On February 8th 1987, Michaël was fatally hit by mortar-shelling of the Salvadorian army. The army no longer dares to penetrate in the occupied territories because it’s afraid of the resistance. Therefore it fires from miles away and bombards from the air, thereby hitting civilians as well as the resistance-fighters. The army particularly aims at the hospitals to discourage the population. Michaël became the victim of that. The only reason because the resistance hasn’t succeeded to expel the powers-that-be yet, is because the U.S. pumps millions of dollars in El Salvador, that they look upon as their backyard. The U.S. makes big money of the people of El Salvador and wants it to stay this way. They also won’t doubt about sending in troops to El Salvador if necessary and then it will probably turn into a new Vietnam. Just as with Vietnam, we have to denounce this kind of U.S. politics and help the people who resist this. Michaël was one of them but many are ready to follow him. And they certainly deserve our support. It’s terrible to have to admit but I don’t have any memories about the benefit-concert for the ‘Michaël De Witte Foundation’ itself. During that era I attended minimum one concert each weekend, sometimes even two to three, and I’m not able to distinguish them all that well (except the really memorable ones). 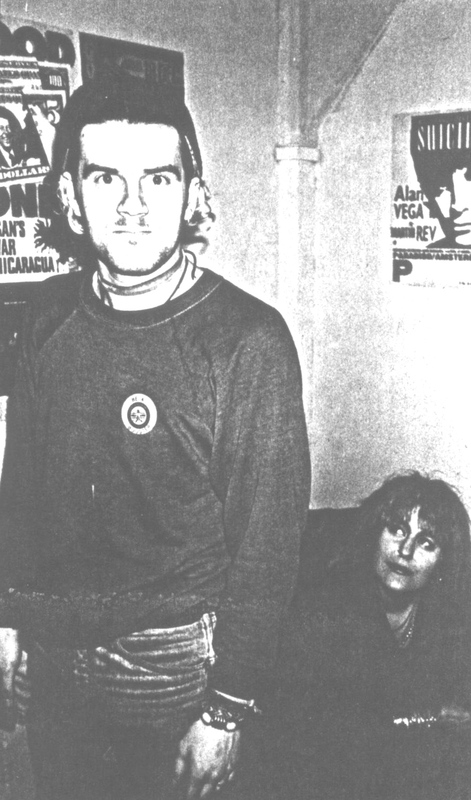 What I dó indeed remember, is that Smurfpunx were always very open to ‘political’ activities, e.g. also that benefit-gig for the ‘Foundation’. I could certainly appreciate this solidarity! I can also ad that the ‘Foundation’ is still active. A few years ago, for example, the diaries of Michaël [Brob: Felix’ brother] have been translated to Spanish, because there are also many Salvadorans who wanted to read it. There was an official launch of that book in San Salvador. 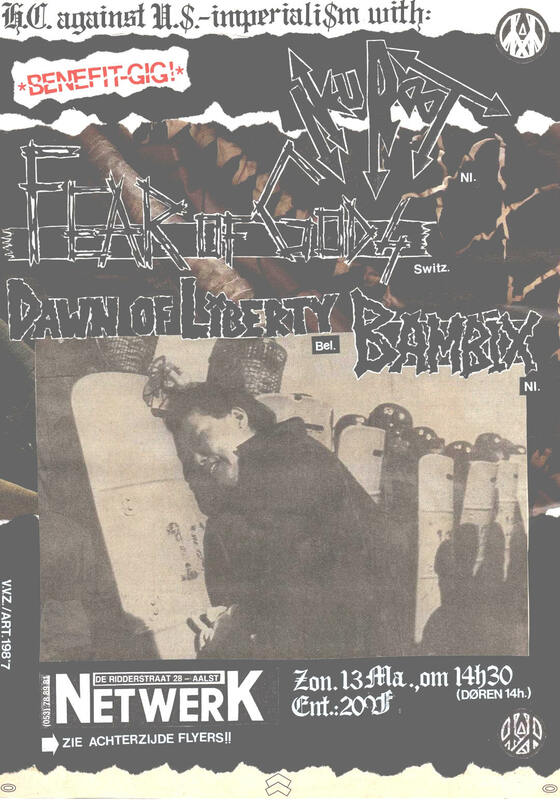 In 2007 the ‘Foundation’ remembered the 20th anniversary of Michaël’s death with a speakers’ evening in Gent: the place was too small because 300 people showed up. In 2012 the ‘Foundation’ will probably commemorate the 25th anniversary. People might also know that the F.M.L.N., the resistance-movement that Michaël worked for, finally won the presidential and parliamentary elections in 2009 and is now in power. That probably doesn’t mean El Salvador has become a paradise on earth but there have been a bunch of progressive reforms in favour of the poor. It also means that Michaël’s sacrifice and that of ten-thousands of other Salvadorans wasn’t completely meaningless. ‘Neuroot’ had recorded their LP Plead Insanity (out on Hageland recs) a few months before this. After the gig their van appeared broken-down: a defect clutch-cable. 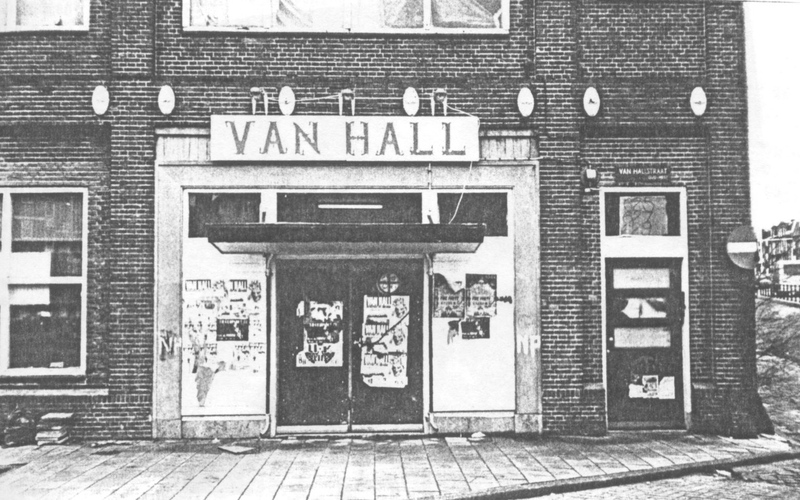 Since there were no repairers willing to help, so late at night, Marcel Stol and his buddies (guitarist Ed, singer Wouter & drummer Ben) couldn’t get back to Arnhem yet and had to stay over in Aalst. Normally Netwerk was closed for everybody; it had been a policy of the people running it, not to let anyone sleep there (because of fire-safety) but this time there was no other solution. Don’t know anymore which of the other Smurfpunx spent the night with them? I did the babysit for ‘Neuroot’. Maybe there were other Smurfpunx but I don’t remember who. One thing that I fondly recall is Marcel – you had to see him: a tough bloke with a rough voice and covered with tattoos – suddenly waking up growling, with a greasy provincial Holland accent: “Hé, ferdomme jô… Fandââch is me moekie jâârich!” (“WTF! Today’s my mommy’s birthday!”) :-) L.O.L. ‘Fear of God’ did not turn up. They cancelled the day of the concert, which we found very amateuristic. 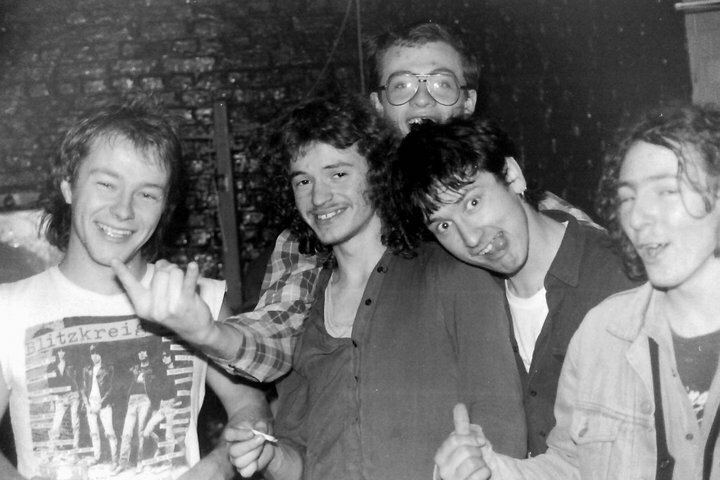 The band was supposed to come over to Belgium from Switzerland for one gig, which was not realistic at the then ongoing rates; but that they should have known earlier. Why this booking then? In fact, this gig had initially been set up at the initiative of Leen and Natasja. But for one or another reason they could not handle it any more and Mokka, Brob and myself took over (we also made it a benefit for the said Foundation). But some arrangements the initial organizers had made were shoddy at best. Personally, I liked to support political causes that did something concrete, like this Foundation. [Brob: Indeed! More than music, right!?] The F.M.L.N. elected in power recently… That reminds how much the world has changed! Back then, there was still something as the German Democratic Republic, the U.S.S.R. and Yugoslavia. The Sandinistas were still in power in Nicaragua (well, their leader Daniel Ortega got re-elected as president again in 2006 but is a far cry of what he used to be). Today’s Latin left-wing icon, Hugo Chavèz and his Bolivarian revolution were still far-off and there were no Al-Qaeda and Taliban as the new incarnation of evil yet. Ironically, an icon of the salon-left now sits in the Oval Office. The day after a long night in Gooik with ‘Attitude’ and a dangerous drive through the fog, Smurfpunx were at it again. 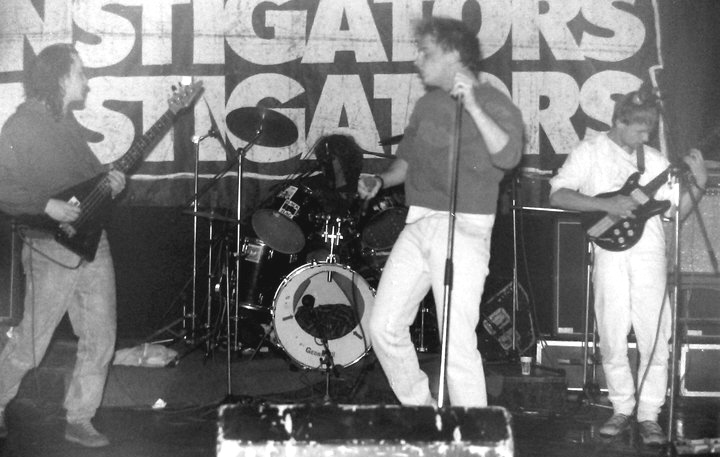 Andy Turner and his ‘Instigators’ were touring (when weren’t they? – smile) so Duco invited them over. 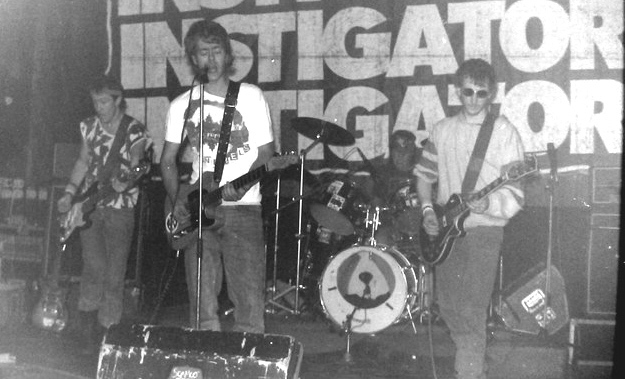 It was only about half a year after their passage in my hometown (with ‘Detonators’; see: Marbel, Tielt, 3 apr 87 (Detonators)) but now Bob Gorlik played the bass. Netwerk was not available so we diverted them to Antwerp, where they played an old cinema, re-baptised ‘Jungle Of Joy’. We already knew Tez and his mates as fantastic people and they did a great set! Oh Yes! ‘Scoundrels’ showed up allright, I know cause I was their drummer. 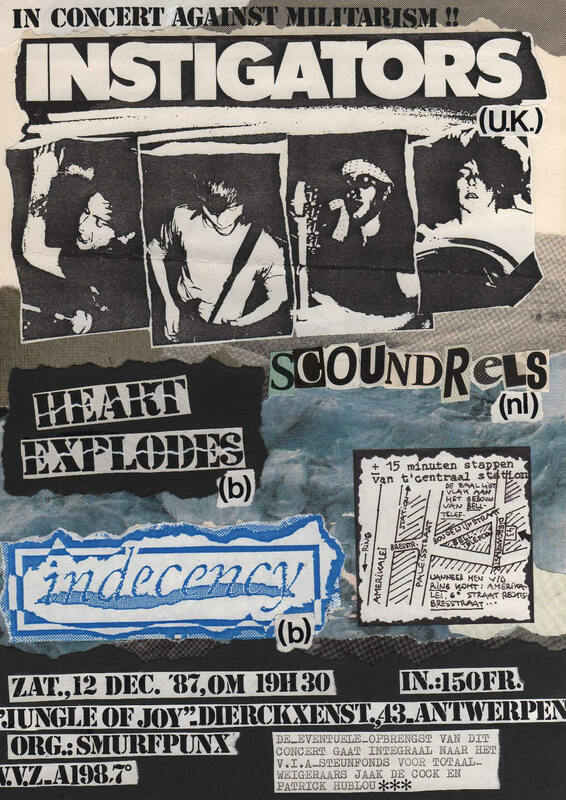 What we played exacly is totally lost in the haze of time but I recall it to be a great evening due to the fact we could open for ‘Instigators’. 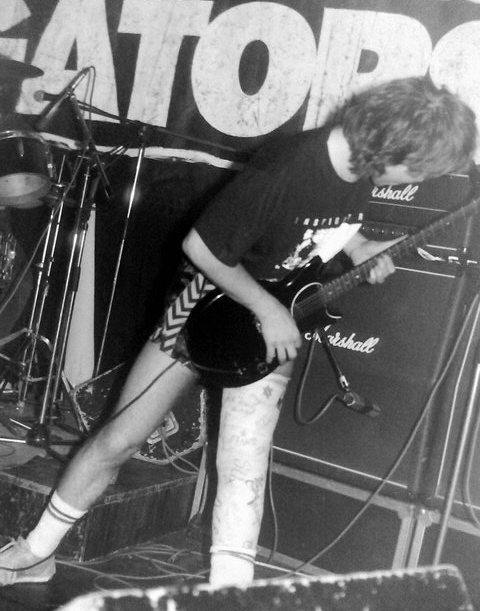 Andy Turner had one of his legs in plaster but still jumped around like hell [Brob: actually, it was Mooney (Simon, the guitarist); as one can see on the pics], I was very impressed by that. Our line-up here was the one with [2nd guitarist] Luc Proost. He only played a short while for ‘Scoundrels’ (during the period of our ‘Join Hands’ album), after that we returned to the primal trio. Luc was also the founder and driving-force of the legendary ‘Wulpse Varkens’.